A loud splash woke us up after a good night’s sleep. It took us a moment to remember where we were. Once we unzipped our tent, we caught two small eyes looking straight into ours from about 15 metres away. The hippo definitely noticed us but luckily we were separated by a thin electric wire which kept all of us safe. We could have never imagined that hippos are so fast - only now did we realise how quickly they could run in and out of the water. The porch of our tent had a lovely view on the lake and besides hippos, we could also watch monkeys passing precariously along the water’s edge, keeping a safe distance from their enormous neighbours. They would gently jump over the grass, stopping for a few seconds to have a quick look on the hippos to their left hand side (probably thinking ‘Yep! We’re safe, they haven’t moved…’), and us on the right hand side. 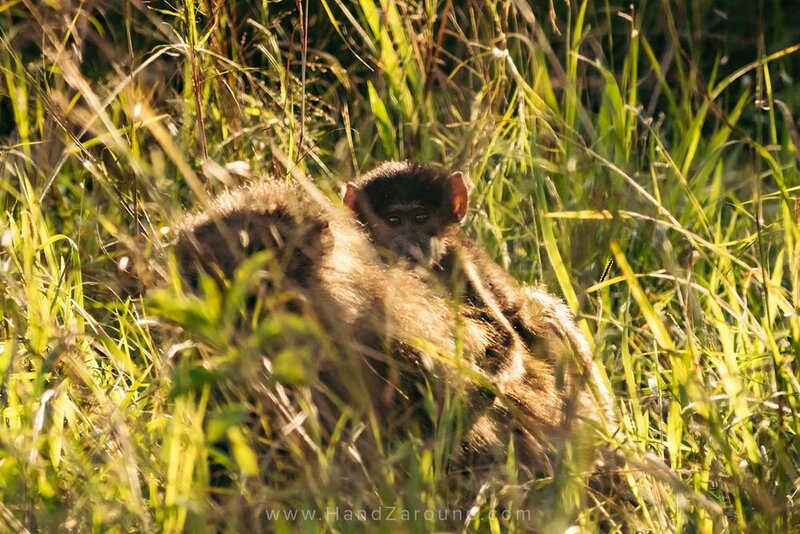 Before we got to Rwanda, we had obviously heard of the gorillas and the country’s capital, Kigali, but we had absolutely no idea that Rwanda would have an amazing National Park - Akagera. Let us tel you all about it! Why is Akagera National Park The Most Affordable And Unique Safari in East Africa? Well… this is only our opinion but we did talk to a few people and they also thought that - Akagera is not only very affordable, but it's also so unique! We’ll tell you all about its prices and how to make it cheap if you’re on a shoestring budget, or splash a bit of money to sleep in some of the quirkiest accommodation if you’r budget is higher - but first let us tell you why we think it’s a one-of-a-kind adventure. In Akagera National Park you’re allowed to go on safari on your own! You literally drive in your own car and you can opt in to have a guide or not. We’ve chosen to do it independently because we think there’s nothing better than independent travel. Of course you do need some guidance and you can get plenty of it at their information desk where knowledgeable staff will tell you where to head in the park to spot your favourite animals. But discovering the park only with your better half or a group of friends is so much fun! Guides are great, but you know… you can have so much more of a laugh if it’s only you two, and you can decide where you want to go. Of course if you’re not a fan of self-drive safaris, you can hire a guide to go with you in your car, or you can hire a guide and a car. Renting a vehicle, with a guide and driver, for max. 7 people for the whole day costs 280 USD. Hiring just a guide for the whole day costs 40 USD. Another thing that makes Akagera awesome is its landscape. The other parks we’ve been to have been very safari-like. Plains, some bushes, some acacias, vast open spaces. Akagera is different. 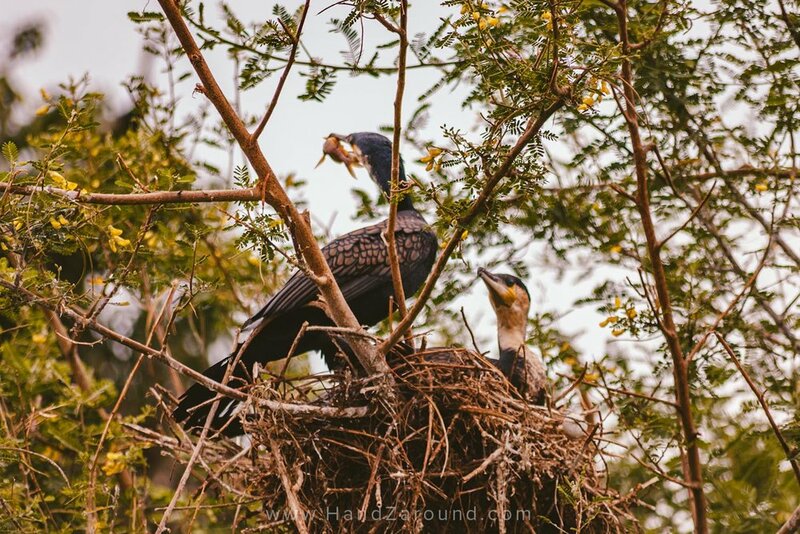 It has mountains, lakes, swamps, forests, plains… it’s really exciting to drive through roads that are embraced by thick shrubs, only to emerge into a vast savannah which then takes you on to the lake’s shore. There you can watch herds of hippos bathing lazily. Then, if you turn into yet another road, you can find yourself driving on the mountains’ ridge with amazing views of the rest of the park. Even if you don’t spot any animals (which is impossible! ), you will still be entertained by the landscapes that just make you feel free and appreciative about the world - you get a real sense of how remote and wild this place is and it fills you with respect to the environment. It’s worth noticing that sometimes you can drive the whole day, and you will not meet another car - you literally have the whole park to yourself! What else is great is that if you’re very lucky, you may be able to spot The Big 5 (lion, leopard, rhinoceros, elephant, and buffalo). Personally we wouldn’t count on seeing all the five species because the park is quite spread out and animals are scattered, but maybe if you spend enough time driving here and there, you’ll manage to see them. We spent in the park 3 nights and 2 days, and saw plenty of hippos, giraffes, zebras, antelopes, warthogs, monkeys, crocodiles, buffalos, wildebeests and lots of birds. We also heard lions and elephants, and saw plenty of fresh elephants’ poop, but we must have been going in the opposite direction since we didn't get to see any elephants. We heard that people usually get to see many of them though. We didn’t get to see the rhinos either but the park has almost 20 of them (which is so many taking into consideration how endangered this modern-day-dinosaurs’ are!) and the 'Behind The Scenes' tour can teach you some extremely interesting things about rhinos’ conservation. Is Akagera National Park The Cheapest Safari Experience In Africa? Less than a 100 USD per person for 2 days for everything* is pretty cheap, isn’t it?! We seriously haven’t heard of any other two day safari for 100 USD with accommodation included. And you get to stay right in the park! Of course the accommodation is basic for that price, but camping right in the middle of the park may be a fun experience. Let us talk you through the accommodation options in Akagera and tell you about our experiences. Driving yourself saves a lot of money. Akagera has 3 campsites - two in the South of the park, and one in the North. You can enter or exit the park through the South Gate but you can only exit through the North gate (you CAN NOT enter the park through the North gate). Some of the campsites are fenced. What Akagera has done with the fence is actually such a great idea - the campsite has an electric fence around the entire area, however, they have put a horizontal section of the electric fence on the ground that allows cars to drive over the top of it. Simple but brilliant in our opinion, as the animals won't cross. Some campsites have a basic toilet block, a roofed rotunda with a fireplace, an open camp fireplace area with lots of wood, a well with water and a bbq setup. Each campsite costs 25 USD per person per night. Renting the tent costs 20 USD per night, and the tent fits up to 6 people. We didn’t get to stay in any of the campsites but we drove in to the Muyumbu Campsite to see what it looked like and we think it had one of the best facilities as far as campsites go. It reminded us of the camp in Wompatuck Park in the USA, and similar to our American camping adventure, we visited this campsite when the rain was horribly pouring down! Unfortunately we only visited the campsite when it was raining but with a bit of sun it would be great to stay there with a few friends and beers! 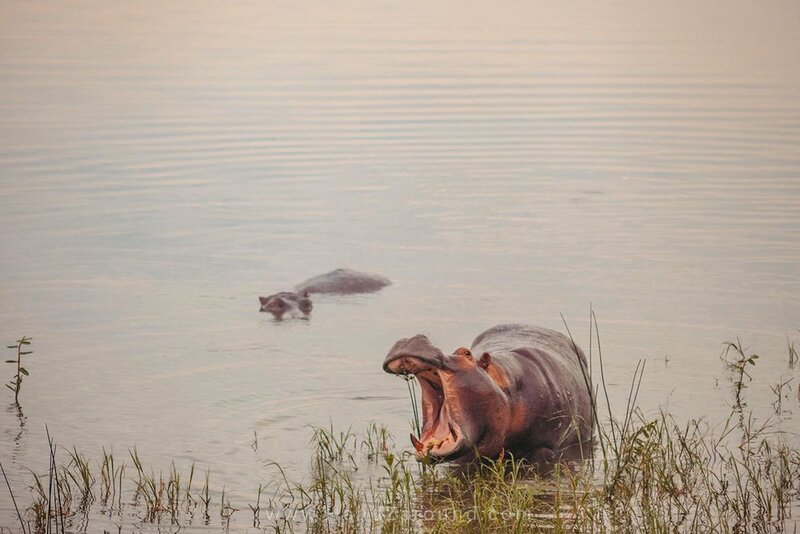 We mentioned before that we woke up one morning because of a heard of hippos splashing right in front of our porch. That’s when we stayed in Ruzizi Tented Lodge. This lodge has nine private en-suite tents scattered along Lake Ihema’s edge. They’re not ‘normal’ tents though! The tents are enormous and feel more like one-of-a-kind houses decorated in African style. All the tents are connected by a wooden boardwalk for safety - so that you don’t step on any crocs, snakes or other slimy creatures. Each tent has power sockets (entirely powered by solar!) and huge beds. The bathroom has all you need and either a shower or a bath. 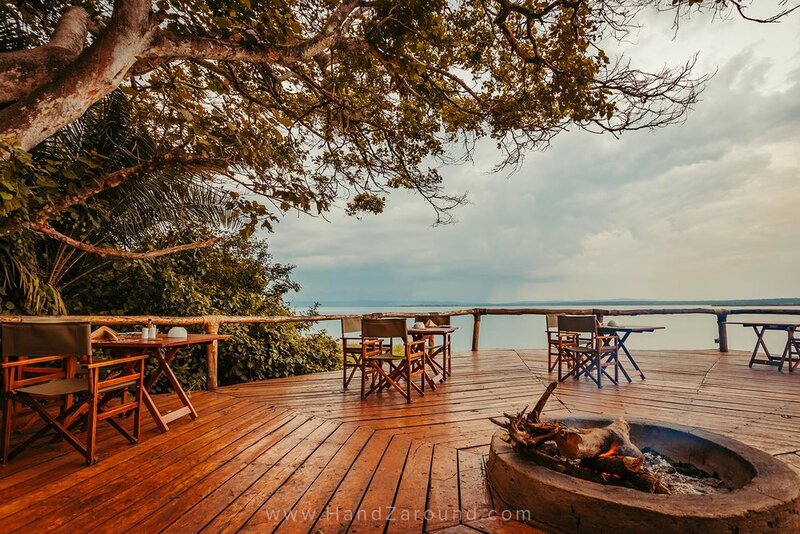 The reception and dining area is the centre of Ruzizi Lodge and you can dine either inside, or on a large round wooden deck/pier place over the swamp and lake’s edge (and in the morning when you enjoy your breakfast, hippos may keep you company!). The best thing about the lodge is, that even though it’s a bit pricey, all the profits go back to the park and fund things like law enforcement patrols, community development and conservation initiatives. So whilst you’re having an unforgettable stay in the nature, you’re also helping the local community thrive. Below you can find current rates for Ruzizi Tented Lodge. They all include full-board (breakfast, lunch, dinner). Drinks and entry fees are not included. We absolutely loved our stay at Ruzizi. It’s located in the South, quite close to the South gate to the park. The food was delicious and dinners can be best describe as fine dining. The staff were so thoughtful - they made sure we wouldn’t get wet when it was raining and run towards us with umbrellas, and when we left our car to go on a boat tour, one of the staff members surprised us and washed it (!). The atmosphere of staying at this lodge is something that you just can’t describe. Waking up to the sounds of all the amazing birds, watching the hippos graze from your porch, or enjoying the spectacle of flashing lightning bolts coming from far away over the lake whilst you’re having a drink on the wooden deck… we know this lodge is not cheap to stay at but it’s easy to justify your choices when you feel all these happy feelings and the nature is literally hugging you. Karenge Bush Camp is a seasonal set up (1st June - 31st August & 15th December - 28th February). Since ‘karenge’ means ‘little foot’ in Kinyarwanda, the camp is all about leaving the smallest footprint possible. 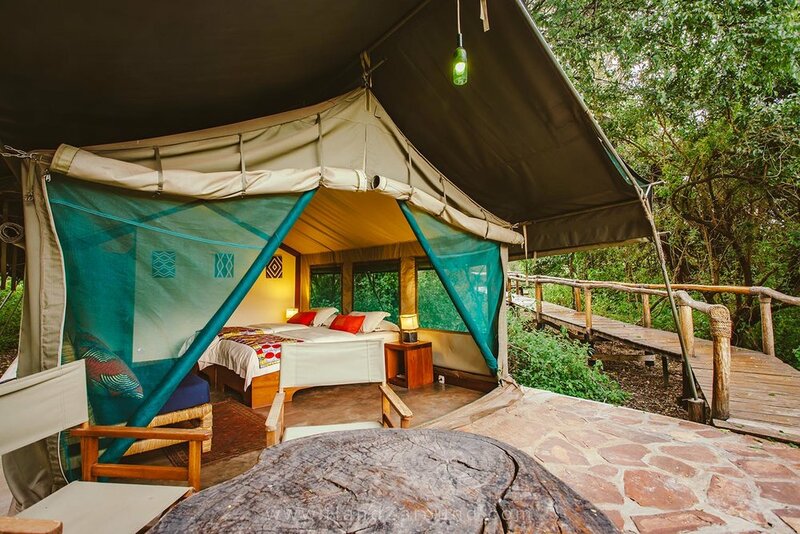 The camp is located in the North of Akagera and consists of only 6 tents. 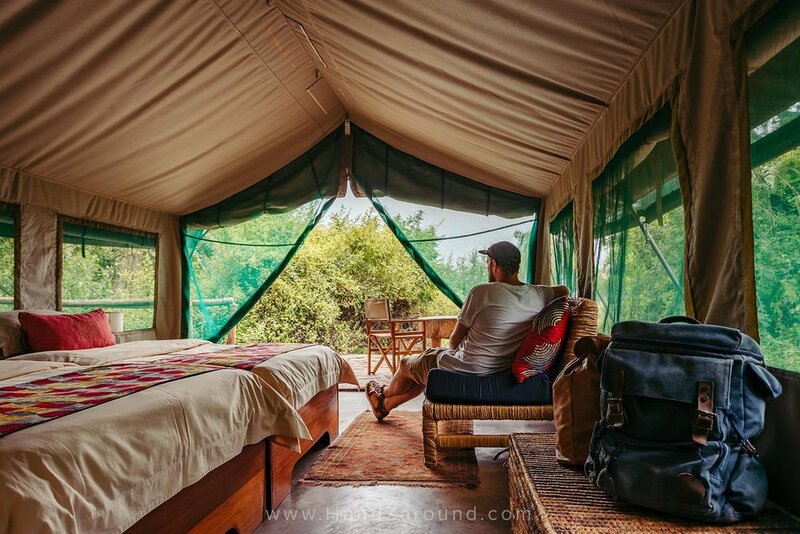 Unfortunately during our visit it was closed, so we didn't have a chance to visit it, but we believe, taken into consideration how amazing Ruzizi Tented Lodge was, that Karenge Bush Camp is surely a brilliant glamping experience. Below you can find current rates for Karenge Bush Camp. They all include full-board (breakfast, lunch, dinner). Drinks and entry fees are not included. 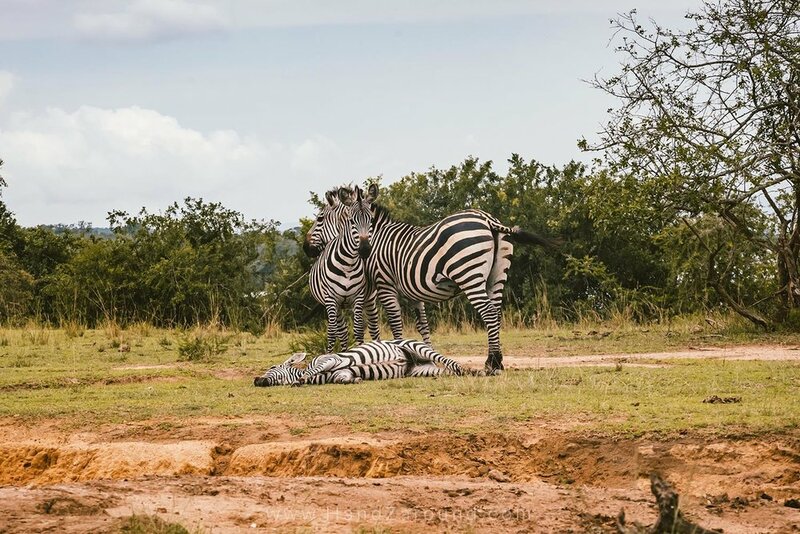 Akagera Park also has a 120-bed hotel called Akagera Game Lodge in the South, and soon there is another luxurious accommodation option opening up in the North of the park. We know it sounds funny - it’s a national park so what activities would there be? Of course, safari game drives. But actually Akagera yet again is different - you have so many other unique things to do here. There is a boat ride safari, Behind The Scenes tour, night game drive, fishing, community tours and ‘walk the line tour’ (where you can follow the fence route which the park’s guards walk every day). We of course got up to a self-drive game viewing, but also to a boat ride and a Behind The Scenes tour. We already told you how awesome our self-drive safari was, but have you heard of a boat safari? 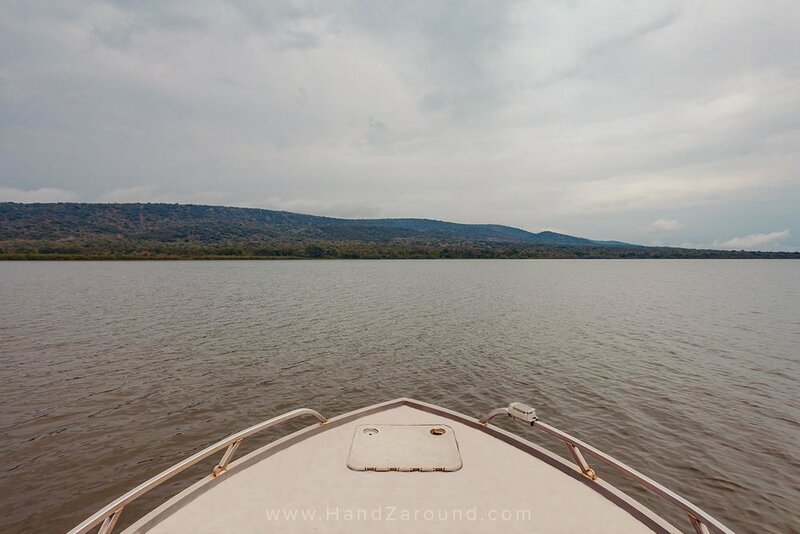 Not many parks have that on offer so when we heard of a boat ride on Lake Ihema in the Southern part of Akagera, we got pretty excited! Even though it was quite cloudy and rainy when we did it, the trip around the lake was wonderful. Our guide knew exactly what he was talking about and we’ve seen so many bird species, crocodiles and an enormous herd of buffaloes on another side of the lake. Price of the boat trip is 35-45 USD per person. The Behind The Scenes Tour was probably one of our favourite experiences during our travels. We learnt so much about how the park is managed, protected and preserved. Sarah, the Tourism and Marketing Manager, took us around the park’s offices and told us how it’s all started with Akagera - about its difficulties with poaching, preserving endangered animals and the work that is put into tracking them. We visited Akagera’s K9 unit that helps protect the park against poachers and we learnt about ways to ensure that the park’s animals are safe (tracking, monitoring their health, and patrolling the routes). Can you believe that just a few years ago there were hundreds, if not thousands, of snares scattered across Akagera, whereas this year the patrols found only a few?! It was kind of amazing to realise all these things that make sense, but when you don’t think about them, you don’t even know they exist. It was one of those experiences when you learn one thing and you realise that there is a whole new world that you don't known anything about. We left Sarah and Akagera’s offices totally astonished with the amount of work that the management have completed over the last several years. If only we could stay in Akagera for a few more nights, we would surely try their other activities - seems like we need to come back! Behind The Scenes tour is 25 USD per person (min. 4 ppl). When you drive yourself around Akagera’s National Park, it’s important to have your wits about you and decide where to head first. As soon as you enter the park and get to the information desk, get a small map of the park for a couple of dollars. All the routes are marked and if you want to get their guide book for another couple of dollars, you will find ideas of routes for your game drives. On the morning of our game drive, we headed to the information desk to chat to the guides and patrols, who were happy to help us and give us advice on where they saw animals last. They circled the areas of the park where we would be most likely to see a certain species and after that we headed off to explore. We decided to start along the Eastern side of the park and pass swamps and lakes on our right. Since we were driving quite slowly and stopping often to watch and take photos of the animals, it took us about 6 hours to get to the North of the park. It was a very hot day and although our car had A/C, we were opening windows quite a lot and got quite tired from all this heat… but we still had to come back to our camp in the South before 6pm! On the way back we were considering going to the Western part of the park, through the mountain ridges, but since our 4x4 didn’t work, we didn’t want to risk getting stuck anywhere and decided to come back the same route. We made it before dark but if we were to do it next time, we would maybe stop in the campsite up North for a night and drive the back the next day. 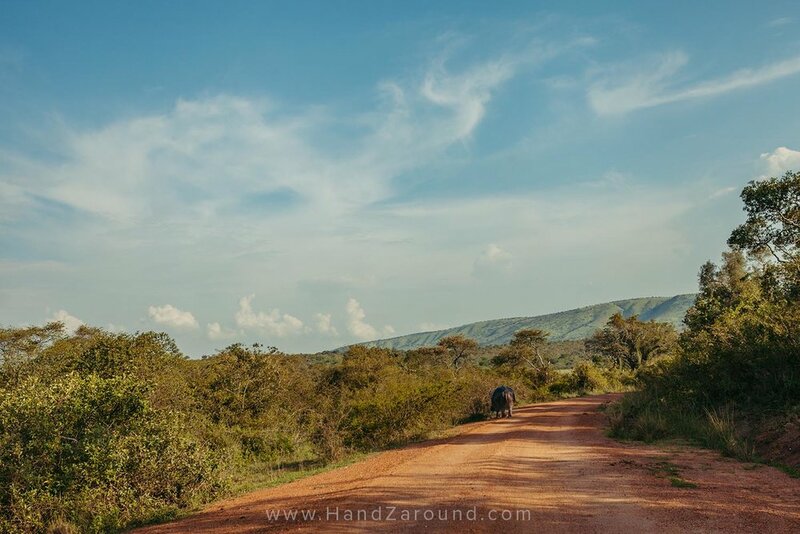 Akagera National Park has plenty of interesting routes to choose from but remember that it takes a long time to get from the South to the North and back. Ideally stay for longer than 3 nights - the entrance is 40 USD for a night (this includes the day you arrive and the day you leave so pretty much two full days if you want to) but after 3 nights your ticket is capped, so you'll not pay more than 120 USD for one continuous visit. Akagera is only about 2 hours drive from Kigali but it’s worth staying at least for a night. It can be pretty exhausting to drive from Kigali, enter the park in the South and exit in the North (6 hours) and come back to Kigali. Don't let the map fool you, it is a LONG way from the South gate to the North gate! Take the 'Behind The Scenes' tour - you will learn so much and a whole new world will be opened in your mind! Make sure you get the information about where the animals were last seen in the information centre just before your game drive. This will help you to decide where to go. Get the map and read the park rules from the information centre. It’s just a couple of dollars but it’s super useful! (check below why you really need it!). watch out for tse tse flies! Tse tse flies are a big pain in Akagera. They’re the ones which cause sleeping sickness although nobody has ever heard of any cases of sleeping sickness contracted in Akagera. They don’t get to you if you just walk or stay anywhere in the park, but they do love the cars and vibrations of their engine, as well as blue and black colours. It was very annoying because our car was blue and if we drove and opened the windows to watch animals, about 20-30 flies would get into our car and their stings weren't too nice! We figured out that if we saw an animal, we would first stop, turn off the engine, watch the flies leave our car’s bonnet, and only after then, we would open the windows. That helped significantly. You will see blue and black flags all over Akagera - they’re the tse tse fly traps that attract them to keep them away from people. 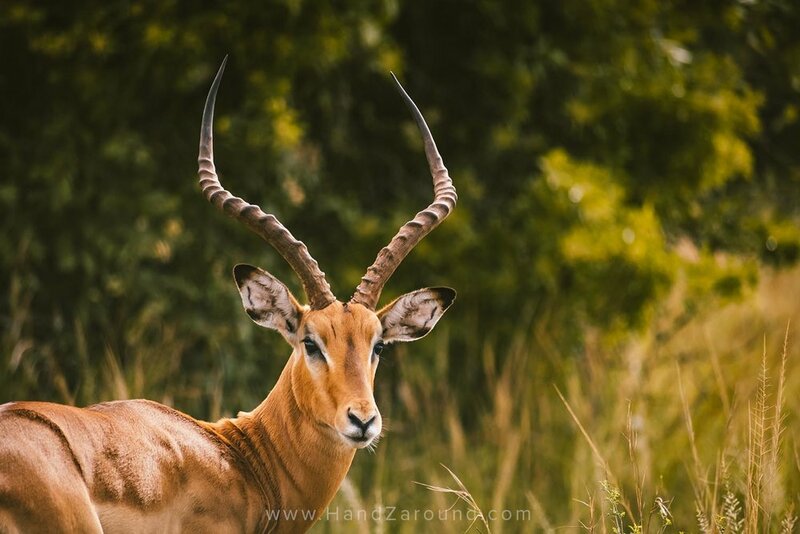 Our entrance and activities in Akagera National Park and our stay in Ruzizi Tented Lodge were provided by Akagera National Park, but as always all opinions are ours and we absolutely loved our visit in Akagera!